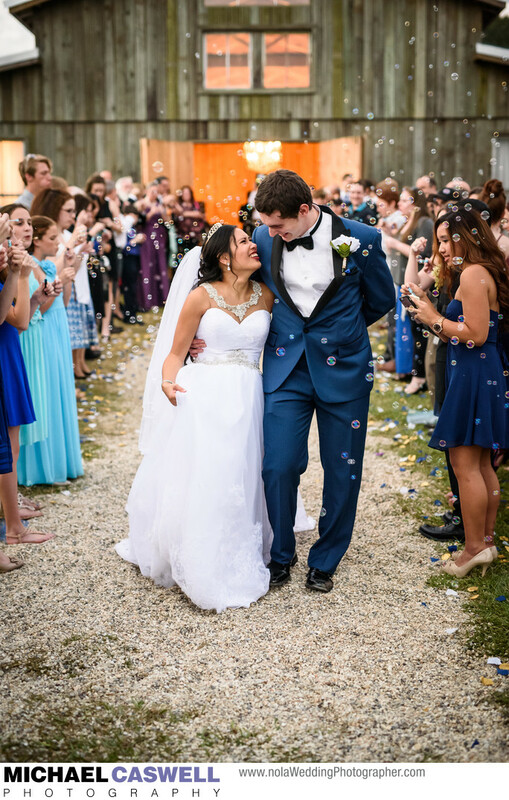 In this beautiful photograph captured in the soft light immediately after the sun had set, the bride and groom depart the Barn at Sarah Bella in Mississippi at the end of their wedding reception through a shower of bubbles from their cheering friends and family members. Though this period immediately after sunset can produce gorgeous light to work with on a nice day, the timing can be tricky, as the level of light will drop very rapidly. This couple gave a lot of thought and consideration to timing the event for the best light outside, which I certainly appreciated. The late afternoon lighting during the ceremony was made even better by the perfect amount of cloud cover softening the sun, and because the timing was so carefully planned, we had just enough of a trace of daylight remaining at the end for the newly married couple's fantastic send-off, which ended up being my favorite series of photographs from this wedding! Though I loved the way this natural light image looked, bubbles also photograph well at night with flash. Bubbles are a great alternative to the popular sparkler send-off or tossing birdseed, flower petals, confetti, etc. Sparklers can potentially be more hazardous, especially when some of the guests may have had a bit too much to drink. Some wedding venues, especially older, historic buildings and/or those with lots of exposed wood, are hesitant to allow sparklers for fear of the risk of fire or for other liability concerns. And similarly, venues sometimes do not allow anything to be thrown during the departure because of the clean-up necessary afterward. Bubbles alleviate all of these concerns. Lastly, a bubble send-off is significantly easier and less risky to coordinate. One of the biggest problems with sparklers is that they only last a few minutes before burning out. Some of this burn time is lost during the process of lighting all of them, leaving just a brief window of time for the departure to take place. If the sparklers are mistakenly lit before the couple is actually ready to come out, the danger is that they'll all or mostly be burned out by the time the couple departs. So, unless you have a good wedding coordinator or an assertive friend or family member in charge of the send-off to ensure it goes smoothly, bubbles are definitely a safer option!